Now that Courvelle Toyota has the Toyota Tacoma on the lot, we're showcasing a few safety features that make this popular midsize pickup truck the one to own today. 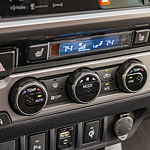 One of the unique system features in the new Toyota Tacoma that will change the way that you drive at high speeds is the Adaptive Cruise Control. Simply select your cruising speed, the radar technology in the forward mounted sensors locates that lead vehicle needed to create a buffer zone. This safer driving distance will now be maintained by your vehicle without driver assistance. The Toyota Tacoma can make driving safer by way of the Lane-Keeping system. Sensors that are pointed at the road are scanning to identify if the vehicle leaves the lane lines slowly. If this drifting action does take place, the steering wheel will begin to vibrate in increasingly pulses, alerting the driver to get control of the vehicle before an accident.